Its surprising in our climate that heat is as big of an issue as it is. But there are scores of sunburned and toasted plants littering our city by the end of summer. You have to take into account reflected heat. That could be heat emanating from an asphalt street such as occurs in a hellstrip or the accumulated heat of a hot wall. Both can conspire to fry plants. Luckily, we grow a LOT of plants adapted to excess heat. These plants won’t fry on the first day above 95ºF. 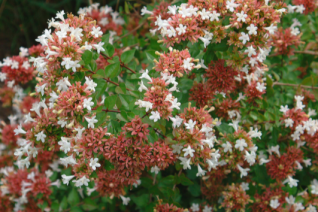 Compact and very flowery this form of the dependable Abelia fits into smaller areas and perfumes the late summer to autumn gardens with masses of small white flowers. To just 3′ x 3′ in 7 years for full sun to light shade and most soils. Drought adapted when established, it will also accept regular summer irrigation. Slow growing and cold hardy evergreen. 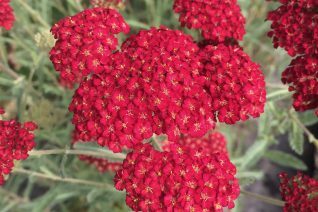 Following the massive bloom, the calyx of each flower remains and turns madder red. A second season of showiness. 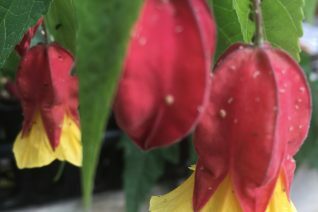 Improved selection of the Chinese Lantern Plant- which is actually from South America, and this form has larger more flared yellow petals. They extend and recurve from the bold red calyx. This arching multi-stemmed shrub blooms almost non-stop from June to frost and often longer. 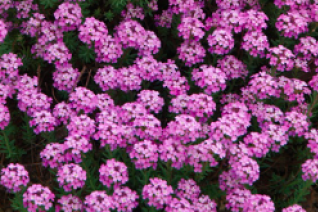 Vigorous to 6′ tall and 4′ wide forming a large patch in time. 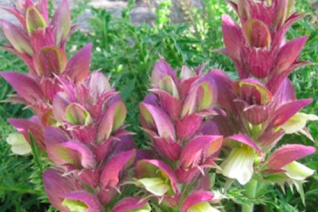 The arching thin stems and skinny pointed leaves display the rows of flowers perfectly. A hummingbird delight. 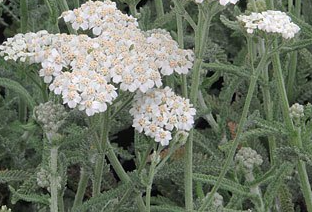 One of the hardiest to cold this behaves as a sub-shrub in the coldest winters- freezing back but returning boldly from the ground when the soil warms. Most winters, damage is restricted to burned tips and the majority of leaves which will drop. Plant with the base in a protected location- for instance between low shrubs to protect the crown, or near the base of a wall. Mulch if arctic (below 20ºF) weather threatens. Following a freeze the plant will look absolutely awful. Refrain from cutting it back until you see new growth emerge- either from the base or vertical stems. In any case water it consistently and heavily until you see vigorous new growth- the transformation with regular water is remarkable. So, don’t by any means give it up for dead. Full sun to quite a bit of shade. A bit tall and lanky for containers- just plan for this. Rich, WELL DRAINED soil improves both cold hardiness and speeds recovery. Excellent performance at the Oregon Coast. 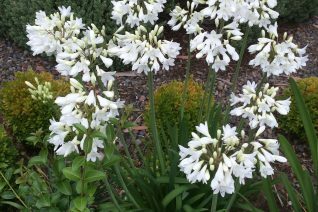 Born and bred in the PNW this excellent compact and extremely floriferous white flowered Lily-of-the-Nile is a first rate selection. 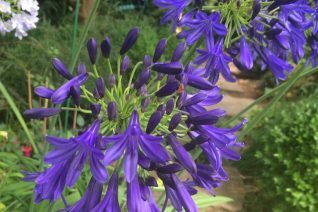 To 20″ tall and forming an expanding but compact clump. 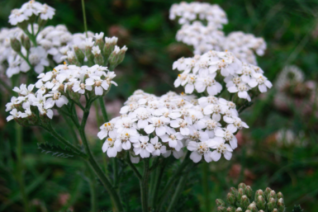 Flowers appear for 4-6 weeks in mid-summer. Clear, pristine white with abundant flower spikes. Full sun to very light shade in rich, well drained soil with regular summer water. Completely winter deciduous. Handsome pale green matte foliage. Long lived plant. An excellent cold hardy Lily-of-the-Nile that was bred in the PNW. To 3′ tall in bloom from a low basal presence of strappy green leaves. Each flower in the truss is light blue with darker blue stripes. They are pretty up close- from a distance it reads as glowing baby blue. And you can use this luminosity to your advantage. Easy to grow perennial for full sun to very light shade in rich, well drained soil with regular summer water. 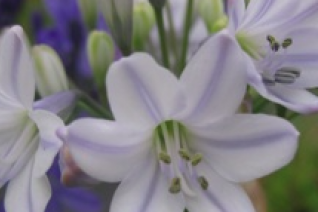 This cultivar performs even without regular water but the blooms last longer and are larger with it. Completely deciduous in winter.